Burt Reynolds’ star was shining very bright in 1973. He was nominated for Academy Award for his performance in the disturbing Deliverance, and he had a couple of more movies in the can (pun intended). Like most superstars with huge egos, Reynolds probably thought he could do anything. So why not make a record? The result is the painful Ask Me What I am. My brother actually bought this collection at a used record shop as a joke, and we spent quite a bit of time listening to the tune “There’s A Slight Misunderstanding Between God and Man” and laughing our asses off. However, I don’t think Reynolds intended it to be a joke. Besides Reynolds inability to sing, the 11 songs were produced by Bobby Goldsboro, who had a big hit with the God-awful “Honey.” This combination is deadly and hilarious all at the same time. 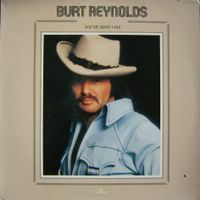 I have no idea how many people bought this piece of crap, but those who did also got a full length picture of Burt on the inside jacket in tight baby blue pants….….fabulous. This entry was posted on June 24, 2008 at 9:45 am and is filed under Lost Classics! with tags Boogie Nights, Burt Reynolds, Deliverance, Smokey and the Bandit. You can follow any responses to this entry through the RSS 2.0 feed. You can leave a response, or trackback from your own site. I think there was a slight misunderstanding between Burt and reality! thanks for a morning laugh. He out Honey’ed Bobby Goldsboro on this one. I just bought this record today at a Habitat for Humanity construction discount store. I think it was 50 cents. Or maybe that was what the price was at the garage sale where it didn’t sell, written in Sharpie on the front cover, before it was “donated” to HFH. I haven’t listened to it yet, more out of embarrasment for what I’m expecting than anything. I bought it for the same reason your brother did. I looked at the cover and the first thing I said…out loud was “I don’t have to ‘ask you what you are’ Burt…the picture says it all. I have a fear of this album. The same way I feared the “Friday the 13th” movie poster at the Milaca Theater in 1980. I conquered that fear and shook with terror through the movie. I’m not sure I can do the same for my new old Burt record. Sit through it I mean, the shaking in terror I’m sure I could still manage. Could someone re-upload the songs. I would love to hear them. Thanks. Ok, I purchased this as well yesterday and am currently sitting here listening to it for the first time while typing this. First, let me say that I collect vinyl, and whenever I’m browsing through a bin or somebody’s records that want to sell and I come across an album by Burt Reynolds, I buy it. I have to. It begs to be listened to. Secondly, I am 42, so I still remember growing up as a youngster in the seventies. That being said, I have to defend ol’ Burt here. It’s not as bad as you might think. I’m guessing that you have to be able to remember some of the music that was out at that time. It wasn’t all that you here on classic rock radio these days. There was another side of music back then that didn’t quite pass the test of time. So if you throw this in with those songs it holds it’s own. It’s definitely better than “Make My Day” by Clint Eastwood. Look that one up. Or how about Leonard Nimoy?